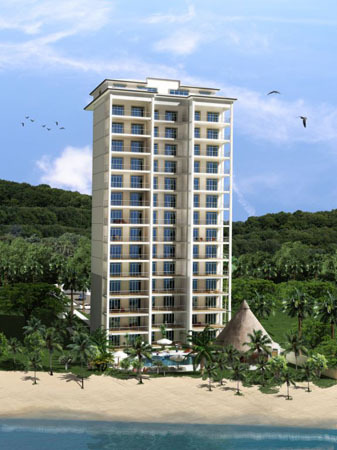 Breakwater Point (44 units) is located at the extreme north end of Jaco Beach, where pristine rainforest meets the Pacific Ocean. A stunning beachfront condo tower, Breakwater Point offers incredible ocean views from spacious 2-bedroom condos and two 3-bedroom penthouse condos. Amid the unrivaled privacy of the north end, the site will feature a beachfront swimming pool, gated community and direct beach access. Incredible panoramas from up to 15 floors will span the horizon and neighboring rainforest. Construction started in 2007 and is currently in progress. Please contact us for ownership opportunities.